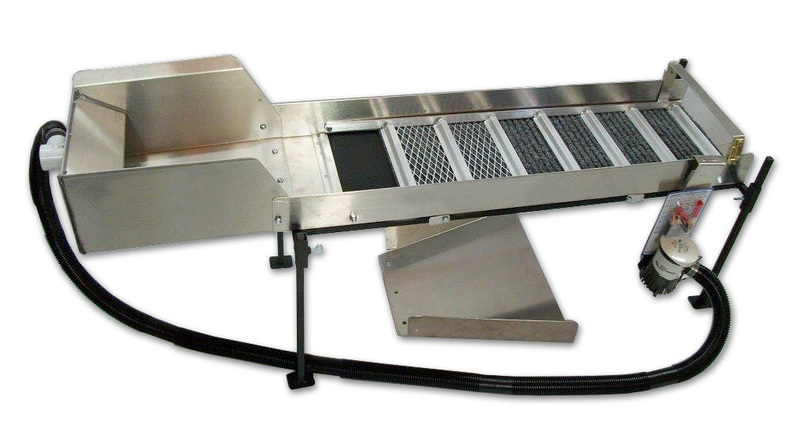 This 10" Power Sluice Setup Kit includes a sluice that is 48" L x 10" W with 3 inch high sides, and a 12" x 10" x 6" header box, a sluice stand with 16" tall legs, a flare that goes from 10 inches to 16 inches, a 12 volt 1200-gph pump, battery clips, and 6 feet of 1 1/8 inch hose. Made in the USA out of strong .080 gauge 5052 aircraft aluminum, which is light weight and aluminum also makes it easier to use a magnet to remove the black sand build up. The riffle cage is also aluminum. Aluminum riffle and box will stand up to many years of use! In the bottom of the sluice box there is 4 inches of ribbed black matting up front for fast gold ID, followed by expanded metal over 27 inches of miner's carpet. The 10 inches of expanded metal helps keeps the gold in the box and prevents the rocks from knocking it loose. The unique elongated 45 degree z-riffles are great for trapping gold. This power sluice header box setup and the 1200-gph 12-volt pump all adds up to a good high volume power sluice! It can also be used with a recovery tub (not included) to complete a power sluice recirculating system. This unit can be used as a sluice or a highbanker. 1. Put the legs on the stand so that the front legs are shorter than the back legs. There should be about 4 inches more above the leg bracket than then front. This should provide a 15 degree slope or, one inch per foot of drop. Check the water flow over the riffles and adjust the stand as needed. 2. Unbolt the flare and set it aside. 3. Bolt on the header box in the same place where you took off the flare. 4. Place the sluice with the header box on the stand with the end without the header box under the slot on the stand. There are also side supports on the sluice stand. 5. Place the pump in the stream or in a tub filled with water if using indoors. 6. If using a tub, place it under the discharge end of the sluice so you can recirculate the water. Place bucket with holes around the top in the tub to catch the waste material so it does not get sucked up by the pump. You are now ready to run material! Good luck getting the gold!